It’s the beginning of a wonderful season- a season of great Food! Great dinners, treats, soups, etc… I love baking and the cooler weather lends itself nicely to great food! The beginning? 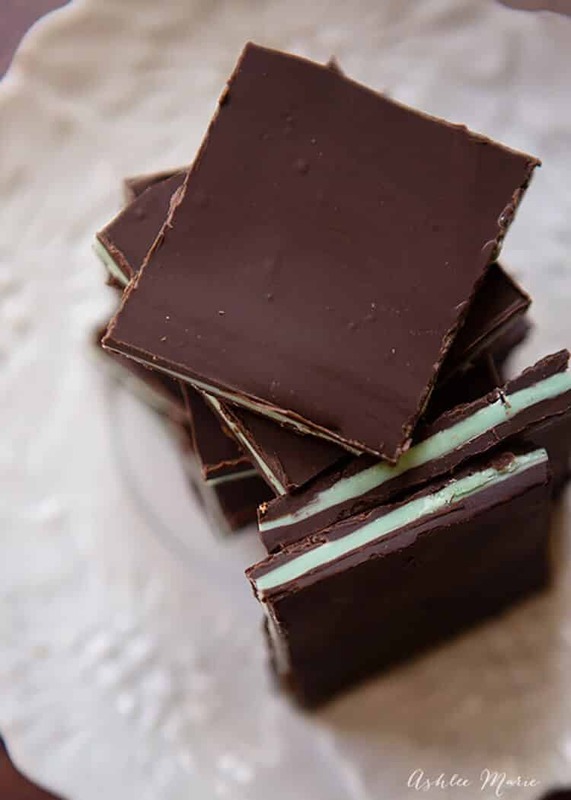 Homemade andes mints (or any other flavor you like!). Aren’t they pretty? And the best part you can do it in any color and flavor. Start with high quality chocolate and use whatever extra flavoring you’d like and this creates a terrific treat! Whatever you do DON’T skimp on the quality of the candy melts. I prefer working with Merkens, Guittards and Callebaut, they taste great and they melt well. You can use dark, semi sweet or milk chocolate and then make sure your colored chocolate are the basic vanilla. So this was actually one of the VERY first video’s I filmed, BUT I never shared it cause it just didn’t really fit SPRING or SUMMER the way it fit’s into Holiday goodies! So this is pre kitchen makeover completed, but I thought it was still worth sharing! Enjoy! Get 3 oven safe bowls. Put the chocolate for each layer in three different bowls. Put them all in the oven on Warm for 20 mins. Then turn off the oven and pull out the first layer (leave the other two bowls in the oven to keep warm). Cut the wax paper to fit the length of the pan as well as come up the sides a bit. take some of the melted chocolate in each corner to hold the wax paper in place. Make sure your wax paper is pulled tight across, we don't want any bubbles, bumps or wrinkles in the paper, it will show in the chocolate. Stir the bowl of chocolate until it's smooth and add 7 drops of oil based candy flavoring to the bowl. Now QUICKLY pour the chocolate around the pan. then starting on the outer edges smooth it with your spatula. Then grab the side of the pan and shake/knock it on the table. After a bit of shaking/knocking the chocolate will smooth itself out. The key to the next layer is to know when to pour it on! If you pour to soon you'll risk mixing the layers together, they'll still taste great, but not be as pretty. AND if you wait too long the layers won't stick together! When the whole layer goes from glossy to matte you're read! Pull out the last bowl, add the 7 drops of oil and stir it smooth. like spreading if you cut to soon you'll mix your layers, if you wait too long you'll shatter the chocolate! Once it's matte take a Sharp knife and cut it! Previous Post: « Sweet 16 Birthday cake! It’s really quite easy! Not really hard at all. Warm, spread, shake… Repeat. And even if it’s not perfectly smooth you end up cutting them up and it’s hard to tell! Ooh! I love those! I’ll definitely be giving them a try this year. They are great! And they not only make a great addition to a goodie plate they are also great melted in hot chocolate! I love chocolate mint, so these sound awesome! How the heck do you cut the lines so straight? I’m just THAT good…. JK. I used a T Square! Works great! Ohhhh I also like Peanut butter and Chocolate! I hope you get to try the mints soon! Thanks! They taste even better! I would eat the whole pan. Dangerous! But a great tutorial! Your nursing, you can get away with it. My problem is I still eat like I’m nursing but I’m not! Those look wonderful! Thanks for the recipe! I hope you enjoy them! They are great! I’m so glad you like them! I really love finding a fun quick and tasty recipe! Those look really good, I am totally trying this out. I always called those pans brownie pans, too. I had to call my mother and ask her what a jelly roll pan was the first time I came across it in a recipe. I’m so glad I wasn’t the only one! But I still aways use them for brownies. I’ve never made a jelly roll. I should probably try at some point for fun! Oh my! I’m so trying this…like, yesterday! Let me know when you try them what you think! I given you an award! Check it out at my blog, The Crafter’s Anonymous Club. Thank you so much! That is so SO sweet of you! I had so much enjoyment snatching piece after piece out of your baggie this weekend. So tasty. I’ll have to give them a try. It was fun sharing a ride! SO much better to road trip than to drive myself! Glad you could make it at the last min! Hi Ansley. I love your videos on YouTube ??????? Oh yummy! They look really great! They ARE really good. The better quality chocolate the more melt in the mouth delicious they become! I am pretty darn impressed on how straight of lines you got! Those look delicious. Thanks! The trick is to use a T-square! Yum! I think it might be too dangerous for me to make these- I know I’d want to eat all of them. Luckily for me my kiddo’s found them and ate most of them for me! Sure! I’d love to link up! You have a new linky tool, different than I’ve seen before. Do you like it? I LOVE these! Putting them in the file so I can give these a whirl! They are quick, easy and tastes great! I hope you get around to making some! Those look DIVINE! I may have to give that recipe a try. It was great to meet you and put a real life face to a blog on Saturday at Boot Camp! It was SUCH a treat for me! I still think of my blog as this tiny thing that nobody but my friends (whom I bribe) to look at! It was so much fun to meet In PERSON someone who “knows” me! I hope you weren’t TOO overwhelmed Sat. Lots of the choices (wordpress or blogger, etsy or not, more of this or that, changing names, domain, etc….) come about naturally as you find your path. Just make sure your having FUN and that’s it’s enjoyable, not one more “chore” in our busy lives and you’ll find the right answers for you! No biggie, your not the only one. You don’t have to go with the chocolate flavored ones, you can pick any of the colored (or not colored- white) ones you want and the favors are compltely determined by which oils you use! So white chocolate and raspberry are totally acceptable! Looks awesome! I can’t wait to try making these! Let me know when you do! They really are fun and delicious! I’m so glad! Now get baking/cooking/melting! Oh my! I love mint! I wish I could reach through the screen and take a handful of those. Yummy! I agree. mine are all gone now and just looking at the pictures is making me hungry for them! Good thing I have stuff for another batch or two! These look delicious! I did a small feature on my blog, feel free to grab a button! Thank you so much! I’m so glad you liked them, and I am up there with so many other wonderful crafts from this last week! I’m tickled! These look great! I love Andes mints. They taste even better! You’ve got to try them! Woah, those look perfect! I love Andes Candies. Not only do they taste great, but they remind me of my grandpa who always had a stash of them. Thanks for sharing this. I’m definitely adding these to my candy list this year. What a fun memory! I always liked andes mints, but never actually bought them, so these are just a treat! I hope they turn out well for you! Those look fantastic. I never would thought to make these myself! wow, looks good. what a great gift these would make! That’s what I thought!!!! I do goodie plates every year, but some of these would make a great teachers gift and much less messy! This are totally going on my treat list this year… I can’t wait! RIGHT? They are so good, I think I might have to buy even more supplies than the 3 batches I have! OOOOO YUMMY! I cant wait to try these!!! Thanks Ashlee for linking up! These look so yummy in my link party!! Thanks! And I have to say your button necklace is really fun! I really think the best part is that I can make them any size I want. Not tiny like the manufacter!!! That’s right! Mine are MUCH bigger. Those tiny ones are completely useless! Like half a bite! Just make sure you get the GOOD candy melts. It makes all the difference! Seriously? I am so making these! Thanks for the recipe! They are terrific! In fact I’m craving them right now! Every time I get a comment on them I wish I had some of my own again! Ooh, I love Andes mints – I bet they are even better homemade! They really are better! Good luck trying them out! Thanks so much for sharing! I found your link at tipjunkie!!! I would love it if you would stop by my blog, http://www.vwbblog.com/! I’m doing a giveaway of a bag I made! I LOVE IT! I LOVE your princess inspired head band flowers! They are GORGEOUS! I am SO going to have to make some sometime soon! Oh my… I NEED to make these! They look sooo good, and yours look perfect!! Thanks for this tutorial!!! You DOOO need to make them, I insist! oh man this looks awesome I definitely am going to try it out! Exactally! I don’t think you could mess them up worse than just getting the chocolate a little swirly! And even they they still taste amazing. They look so beautiful and yummy! Great tutorial. I think I could do this one :). thanks! They do turn out really pretty and you can totally do this! There are lots of pictures and instructions, but they really are very easy! Love,love,love this!! I need to make some asap! Thanks for sharing. Yes you do (need to make them right away!). I’m so glad you liked them! these look like they came from a fancy chocolate shop. chocolate and mint is my fave combination. your tutorial is great too! found you through tatertots…so glad i did. Don’t they (look all fancy and stuff). And so easy, I love pretty and easy and tasty. The perfect combination! I love andies! Ooouuu I just may have to try these. I am bookmarking your ‘recipe’! 😉 Great tutorial and I’ve never melted chocolate like you do….but LOVE that it’s EASY. Real chocolate you have to be careful with, of course, but this way would work great. I also like to use a double broiler, but for these smaller batches the oven works great. PLUS these are chocolate flavored candy melts, not normal chocolate, so they melt well almost anywhere! They would be hard to burn so even you microwave works! My whole family loved them! I try to keep my more “adult” candy for myself, but my kids LOVED them! Next time we’re going to try some fun flavors that the kid’s pick out! mmm these look delicious and perfect for the holidays! They really are! Of course anything peppermint is perfect in my book! Quick question for you! Can you put these in a little plastic gift bag or will they get all soft and look bad? Are they better given on a plate? Thanks!! I’ve been thinking about this. I know you can give them away in gift boxes, all stacked nicely together, without issues. Since they are candy melts and not pure chocolate I think they would work in a bag just fine! Thanks! I hope you try them and like them! I know, right???? Mint is probably my 3rd favorite food, behind chocolate and coconut! Thank you so much! I always love it when people think enough of something to link up! I hope you try them out! These look so good and easy. 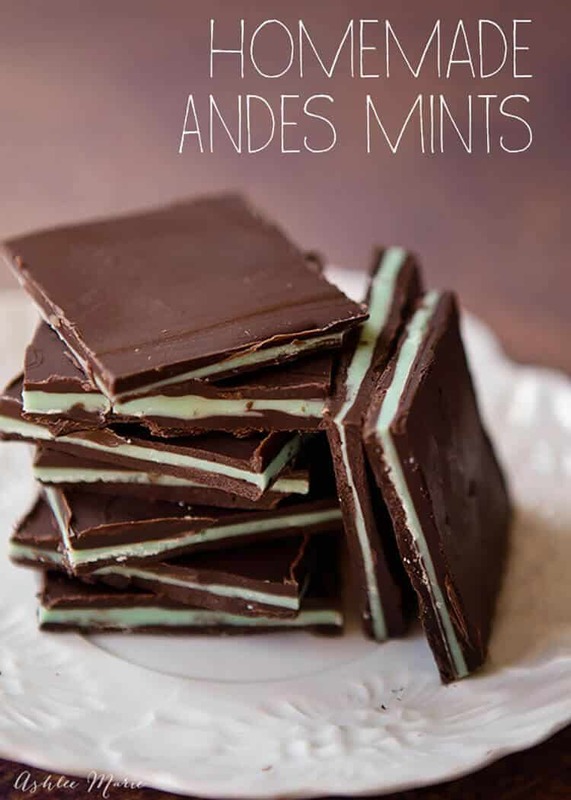 Andes mints are one of my favorite candies and these are perfect for the holidays! Also you can cut them MUCH smaller if you want, I guess my bites are a tad on the large size compared to andes mints! I LOVE Andes mints!!! This makes it seem so simple to make them… I had no idea! Thanks for sharing! they are SUPER easy!!! I hope you try them and love them as much as I do! These look amazing and very impressive to tell people you made your own Andes!! Thanks for the tutorial! Thanks! I hop you try them out and like them. Ummmm Normal size??? It’s the largest in a set, like 12×17… Anyone else? Is that right? I am speechless! I love Andes mints and I am so excited I found your recipe, I can’t wait to try it!! They are AMAZING! let me know what you think when you make them! Ooooo! Love! Where in Utah do you get your candy melts? Actually I got them from the woman who taught the class at our church. She sells them out of her house. I’ll try to remember to get her number! I need some more supplies anyway! Gygi’s on 300 E in Salt Lake has some, but they only have the pre-flavored colors, NASTY. But you could get the chocolate and whites and dye the white yourself! These look amazing! I am totally going to try these! Yes you TOTALLY need to! When your ready to get out and about again we need to have a GNO so Kara and I can squeeze that sweet baby of yours a bit! Delicious! I want them NOW! I used to use Guittard Melt N Molds but haven’t stocked up in awhile, so maybe I need to try Merkens. I will NEVER buy Wilton or cheaper brands anymore. For those that mess up, just break it up into chunks and they will still be eaten. My family dives in before ever really paying attention to shapes, designs and colors when I make chocolate. Isn’t that the truth!! You get what you pay for when it comes to chocolates! Totally worth getting the good stuff. You have to cut them while they are still soft if you want squares. If you don’t mind broken ones then shattering it when it’s cool works just as well. Like you said, who really cares about the shape! I love the recipe. Can you recommend a good place to buy flavor oils. I am in the middle of making cherry chocolate caramel popcorn when I realized that I have never flavored chocolate before. Your recipe answered the how. I just don’t know where I can buy the flavored oils. Thanks. Can you please redo this in recipe form? I like to check to see if I have the ingredients first. I dont really like that I would have to read the whole thing to figure out the ingredients. Thanks. cover the bottom of the jelly roll pan with parchment paper. pour it into the jelly roll pan, shake smooth. wait until it get’s dull and pour the next layer, repeat. When the top layer is dull cut the chocolate- if you wait too long it will break instead of cutting smooth! Hi they look amazing. How long will they keep in an air tight container? Ummm since ours get’s eaten so fast that’s hard to guess 😉 they’ll actually stay good for quite some time. since your not adding anything to the chocolate melts but the oil flavors they’ll stay good as long as the chocolate does. a year or more if you don’t let them get to hot or too cold. These look so yummy! I’ve recently discovered the Andes holiday peppermint crunch mints. Do you think crushing candy canes into almost dust, then mixing that with the top and bottom layers would cause any problems? I think it would TOTALLY work, in fact I was planning on trying it myself this year, those are my daughters favorite! Where do you get a T Square cutter and also doesn’t the wax paper stick to the bottom of the chocolates? I made the T-square from a yard stick… and you just peel the wax right off if it sticks, it’s easy. RIGHT!!! I used red vanilla melts with crushed candy canes this year, the kids LOVED it! Thanks so much for posting this recipe! We love Andes candies in our house, and we can never seem to get enough. We still may not be able to get enough (are there ever truly enough Andes candies? I think not), we will be able to have them whenever we want! YEAH! What is the yield for this recipe? What size squares (rectangles) do you cut? I am definitely going to try these next Christmas! What is the difference between Chocolate wafers and Vanilla candy melts other than brown and white? Is chocolate wafers chocolate candy melts???????????????????? These look amazing! Could I use vanilla almond bark instead of the candy melts for the middle layer or are they not interchangeable? chocolate wafers – like guitards, or Callebaut or Merckens – you get a much better melt – candy melts or almond bark aren’t chocolate at all- so yeeeeeesssss you can, you’ll need green oil dye (not water based) to get the color and the end result won’t really be authentic – as it won’t be chocolate. Just made a batch and they are wonderful! One question – should I keep them out, or store in the fridge?